Initiated in 2016, this project aims to investigate and implement control techniques that achieve optimal voltage control within electrical distribution systems using renewable and distributed energy generation sources (DGs). Voltage control is extremely important within power grids – overvoltage conditions can cause damage to grid assets while undervoltage conditions result in poor power quality and brownouts. If properly controlled, DGs can play a crucial part in stabilizing grid voltage by injecting power to the grid, while simultaneously implementing energy conservation initiatives such as Conservation Voltage Reduction (CVR). The major limiting factor for power utilities when it comes to deploying DGs in the distribution network is that their conventional control equipment is not equipped for bi-directional power flow. This project seeks to bridge that gap by implementing control algorithms that work harmoniously with conventional power grid equipment over open, secure and reliable smart grid communication protocols. 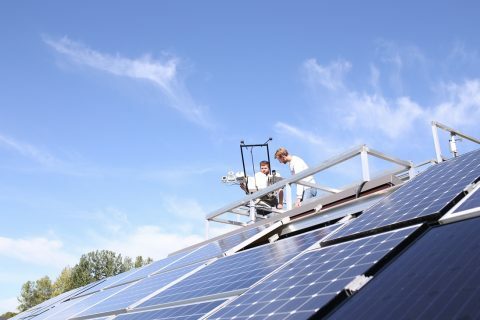 The already existing Toronto and Region Conservation Authority (TRCA) Smart Grid – located at the Kortright Centre – is capable of producing over 100 kWh of renewable energy on a daily basis and will be used to supply the distribution generation for this project. The TRCA Smart Grid will first be modelled using open source power modelling software (OpenDSS) and simulations will be run to verify the accuracy of the model. The control algorithm will then be tested on the simulated model in order to evaluate its effectiveness in controlling the voltage within the network. The final step will be to implement the control algorithm on real-time hardware within the field. Additionally, utility grade communication protocols (IEC 61850, DNP3) will be implemented to allow utilities to have two-way communication with the TRCA Smart Grid. The success of this project will result in a smarter, cleaner, and greener power grid for our future. By implementing the entire solution at the Kortright Centre, STEP will be able to demonstrate this new technology to a variety of utilities and encourage its penetration to different distribution systems. As a result, stiff conservation targets will have new hopes of being achieved. The funding for this project has been allocated for two years. The final delivery of the complete solution is anticipated for November, 2018.